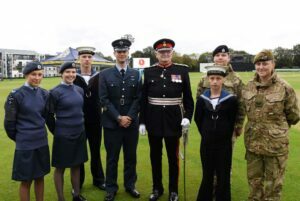 The Lord-Lieutenant of Kent joins cadets. Wet weather did not stop Kent from honouring those who served in the First World War and those who serve the county today. Although the Kent First World War Centenary Service on Sunday 23rd September had to be scaled back because of torrential rain earlier in the day, the poignant tribute to First World War heroes attracted around one thousand people to the Spitfire Ground. 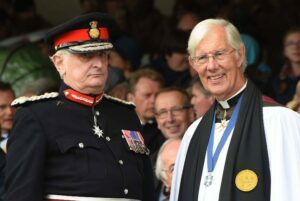 The Lord-Lieutenant of Kent with the Dean of Canterbury the Very Revd Robert Willis. Those attending what is likely to be Kent’s biggest commemoration of the 100 years since the ending of The Great War were treated to a poignant event that honoured those who sacrificed so much. The service, organised by the Kent Lieutenancy, was led by Dean of Canterbury the Very Revd Robert Willis DL with multi-faith participation. The choirs of Canterbury and Rochester Cathedrals sang together for the first time, with some ninety voices making a wonderful sound. The Brompton and Shorncliffe Military Wives Choirs sang period songs beautifully. 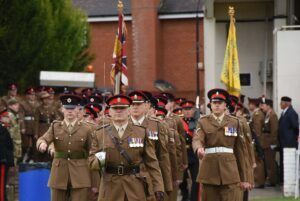 The 3rd Battalion the Princess of Wales’s Royal Regiment march into the Spitfire Ground. The 3rd Battalion the Princess of Wales’s Royal Regiment paraded across the waterlogged ground and stood before an altar of drums in this drumhead service typically seen on a battlefield. The Dean spoke of those “dreadful days” of the First World War. He recalled the year 1918 when the Armistice was signed that ended hostilities at the 11th hour of the 11th day of the 11th month. 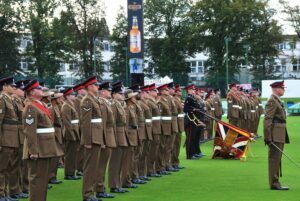 The 3rd Battalion the Princess of Wales’s Royal Regiment lower their flags in tribute. The Lord-Lieutenant of Kent Viscount De L’Isle took the salute. He said: “This was a most moving occasion and a fitting commemoration of the thousands of men and women of Kent who did so much to secure our freedom.